Ranunculus meristus, the Rough-fruited Buttercup or Spinyfruit Buttercup, is a perennial herb that inhabits damp places and belongs to the Ranunculaceae family. The thin leaves are bright green and divided into many linear segments up to two millimetres wide. 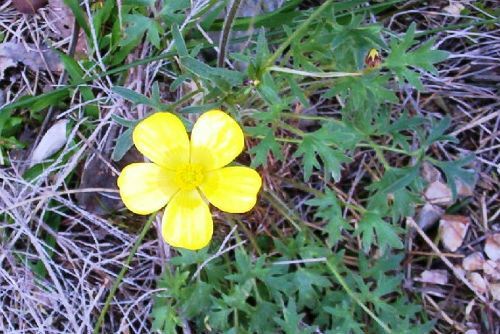 Flowers are typical shiny buttercup yellow with from 7 to 11 petals. Blooms are held above the surrounding vegetation by stems that may be 50 centimetres high. Flowering extends from spring to summer. Seasonal rainfall triggers profuse floral displays. The flowers are followed by dry, rough-coated, single-seeded fruit (hence the common names) known as achenes. R. meristus occurs from southern Queensland to southern NSW. The species is naturalized in south-western Western Australia. The genus name comes from the Latin: ranunculus meaning small frog or tadpole and probably refers to both living in web habitats. The species name means divided and refers to the finely divided leaves. In our cold climate garden, on the Northern Tablelands of NSW, we have a drain that feeds water into a dam. In spring and summer, particularly after good rain, this area is a carpet of a conspicuous profusion of R. meristus flowers in company with Wurmbea dioica (see Plant Profile).